The Series 5Z family of high-performance Adaptec Unified Serial® (SATA/SAS) RAID controllers offers both high I/O transaction and high bandwidth processing for use with cost-effective, high-capacity SATA drives or high-performance SAS drives. The Adaptec RAID 5405Z utilizes industry-leading dual core RAID on Chip (ROC), 512MB DDR2 cache, and connectivity with the latest x8 PCI-Express to deliver over 250,000 I/Os 1.2GBs. Using SAS expanders, it can connect up to 256 SATA/SAS devices. The Adaptec RAID 5405Z supports a broad range of operating systems, compatibility with more than 300 third-party devices, and full integration with Adaptec Storage Manager™ for centralized management of all Adaptec RAID controllers on the network. Adaptec Series 5Z controllers introduce Zero-Maintenance Cache Protection, a revolutionary advancement that maximizes performance and extends power savings by protecting controller cache without battery backup units and without incurring monitoring, maintenance, replacement or disposal costs. During a system power loss, the flash memory-based cache protection can preserve data for up to 10 years. Adaptec Intelligent Power Management slashes storage power and cooling costs by spinning down idle disks and providing a lower power mode for active disks. 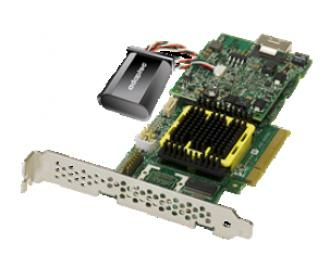 Performance Unified Serial RAID controllers support both SATA and SAS devices. Ideal for bandwidth intensive storage applications; NAS, OLTP servers, web servers, and digital surveillance. Offers Zero-Maintenance Cache Protection and Intelligent Power Management. High I/O transaction and high bandwidth processing.